I have just completed the fabrication of my new truck equiped perfectly for retrieving and lifting large logs for sculpting. 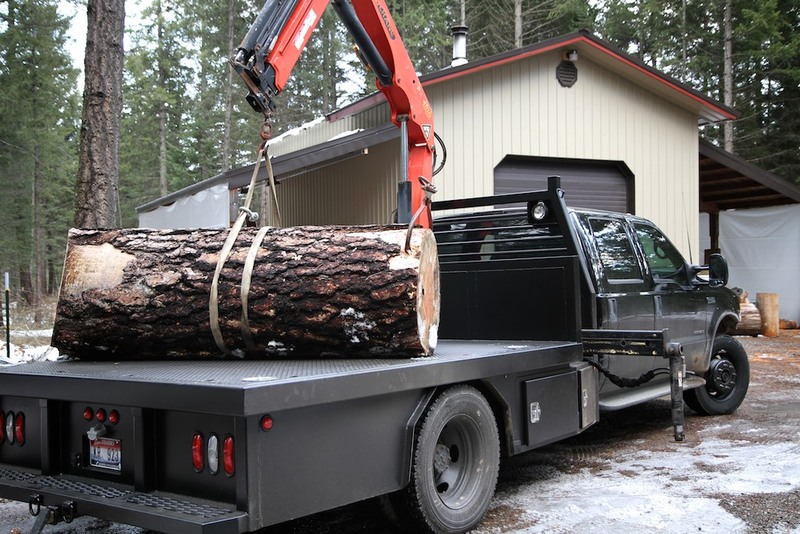 The truck which was converted & fabricated by Cooper Fabrication in Post falls Idaho, It now has a knucklboom crane capable of lifting nearly 2,500 lbs and a 8' x 9' deck big enough for large logs and whatever else I might need to haul. wether it's large Grizzly sculpture, huge eagle, or any other larhe piece, I'll be ready to go! This is part two of my live carving roadshow. * Part one was my 6x12 enclosed trailer complete with a vinyl vehicle wrap sporting www.jeffmay.com and pictures of some of my work. This allows me to do live carving demonstrations just about anywhere, carriying both tools and finished sculptures. orange graphics, and the trailer is also black and orange.